I saw the possiblities between these two in the episode "Conundrum." They positively sizzled. Later on, in the episode "The Next Phase," Riker says he wants to speak about Ro in the Memorial Service. That sparked my interest in the pairing even further. -- AU story, picks up a few weeks after "Conundrum." 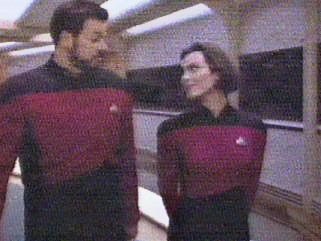 A nervous Ro Laren must tell Will Riker that she is pregnant with his child.